While there are birds practical enough to help people in life - think of pigeons as letter couriers, some birds out there just don't have any idea whatsoever on what they are doing. The dove in the video below is one example. Believe it or not, doves are not clever, not at all. Well, while it's true some birds may find their home after flying a pretty far distance, you still can't consider them clever. It's more like a natural autopilot routine hardwired into their brain, without them realising what they're actually doing. That said, you can't expect doves to do things they aren't exactly created for. 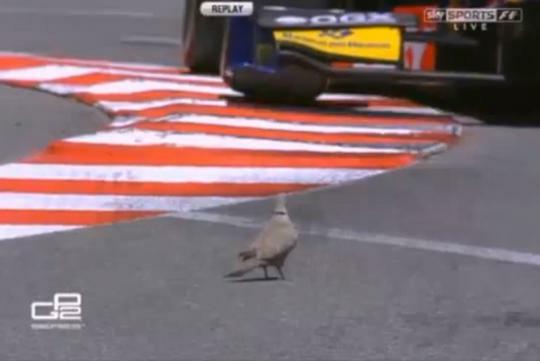 As an example, the dove you can see in the video really has no idea that standing on an F1 track is horribly dangerous, especially when an F1 Grand Prix (GP) is taking place. As a result, it had to play chicken with an F1 racer who happened to be approaching its direction. The F1 racer was revealed to be Brazilian Luiz Felipe de Oliveira Nasr. He was piloting a Dallara-Renault F1 car, racing for Carlin Motorsport. However, being stupid for standing on the racetrack in the first place, I must admit the bird has some great maneuverability. You see, it avoided being flattened by the racecar with a somehow adorable backflip, reminding me of those Kung-Fu moves you see in the movies. Fortunately, the bird survived, which is a good thing - and a miracle, too.